The rising wind and darkening skies hinted at the weather to come. We thought we'd get a walk in before the rain began, but we didn't quite make it. The Songhees Walkway follows the Inner Harbour on the west side. Two enormous yachts lie at the dock on the opposite side. A flock of Canada geese, intent on feeding, were sublimely uninterested in the view. In spite of the weather, the harbour was a busy place. Several float planes took off and others landed. The little passenger ferries bounced from stop to stop. Whale watching boats came and went. A cruise ship came into dock. I'm sorry for the passengers who were likely hoping to wander through town in the sunshine. Knowing the rain was coming, I worked in the garden for a few hours yesterday, picking tomatoes, pulling down the climbing beans whose leaves are yellow and spotted. There were a goodly number of pale tan, completely dry pods that I harvested, both for seed for next year, and to use as dried beans for eating. I dug up some carrots and picked enough kale for a grilled kale, nectarine and goat cheese salad. So yummy, and all eaten before I thought of a photo. I clipped long stems of hydrangeas for the dining room table. On Thursday night I had peeled and chopped enough tomatoes for a double recipe of salsa, and refrigerated them, so I put that on to simmer Saturday mid-afternoon. By 8 pm the lids of 7 pints and 4 half-pints had popped most satifactorily. After our walk today, we've spent a quiet afternoon at home. Rain fell intermittently. I picked some marigolds for the mantel and baked a yogurt cake. Carrot Ginger soup is simmering on the stove for supper. Our neighbours have a eucalyptus tree and I can see the branches tossing wildly. It's a good afternoon to be indoors. Your September days look so satisfying, Lorrie. The hydrangea bouquet is beautiful. Such a pretty color combination. The meals from your kitchen sound delicious too. That salad sounds particularly interesting. Yes, a great afternoon and evening to enjoy the indoors. I'm looking out the window at the steady rain falling. We worked fast this morning after church to get the fallen leaves off the lawns before the rains came in. A pot of soup will be a good thing to plan tomorrow as they forecast more rain to come. Lovely photos and mosaics. The marigolds on the mantel are fun! It sounds like you know how to settle in quite nicely when the weather turns. Your salad and soup sound wonderful, You have a fantastic garden...I'm envious! I do love a day to stay home and putter, and if it's raining it's all the better. Your hydrangea arrangement is spectacular. I see the red--we were given a gorgeous red hydrangea plant a few months ago. We've planted it and I hope it is red again, but I guess it depends on our soil. We enjoyed the vibrant color--I don't think I'd seen a red one before. again this week for work. I love your dried hydrangeas. How pretty your marigolds look. I still have some late ones in the greenhouse where they were planted to keep greenfly away from the tomatoes. Just lovely. Every bit of it! You have been a busy fall bee. I love the iages of the marigolds. Your yogurt cake sounds so good. Great photos. Your ready for rain day sound lovely. Reading you post, I'm hungry for soup. Love your very nice post. Your September looks so beautiful in those so colorful pictures. Thanks for sharing. Your photos are a delight to my eye. How can a plane that big both fly and float? It's raining here in Eugene too -- and I am delighted with that! (I promise never to complain about rain again....well, at least to try). Love your hydrangeas (so pretty in every stage) and that clever mantel vase with the bright marigolds makes me smile! And I'm hungry... time for some Fall cooking -- yours sounds wonderful. Your description makes me long to walk and sit and nibble and smell and experience all of the things that were a part of your September weekend. I love the way you put words together! You live in a place where others come to vacation, don't you? So you're just a step away from a holiday anytime! Lovely, but no more lovely than your garden must be if those hydrangeas are to be believed. So many gorgeous colors in that vase! And oh, the tantalizing scents that must come from your kitchen! You make me want to look up recipes for everything you cook. How about adding that salad and soup recipes to your cooking blog? Lorrie - I think we are on the same weather schedule. We had a glorious sunny day yesterday, with a high in the 60s. We deliberately hiked because the forecast for the rest of the week is RAIN!!! Yippee! So Spousal Unit made a large pot of beef stew and I baked banana muffins today. Now I am enjoying catch-up with all my blogging friends while the rain falls gently outside! The only thing I wish I had was your bunch of hydrangeas - gorgeous! You've been busy in the garden and then so productive in the kitchen, Lorrie! Your hydrangea bouquet and then your marigolds on the mantle are such glorious spots of beauty in your home. I also saw the sweet, dear embroidery pieces that you've created. They are just darling, Lorrie, and will be perfect above the bed where your grands sleep. You're so talented! What a joy to visit and take a peek into your September days. I loved seeing the port and noticing the so many differences to our local port. Such a beautiful floral bouquet of hydrangea, stunning. I think I must make some salsa soon too. I picked a shopping bag full of tomatoes from the garden today. Love your marigolds along the mantel, so pretty. The walk along the shoreline would be just lovely on a cooler day. That bouquet of hydrangeas is gorgeous. The soft hues in those hydrangeas are beautiful! 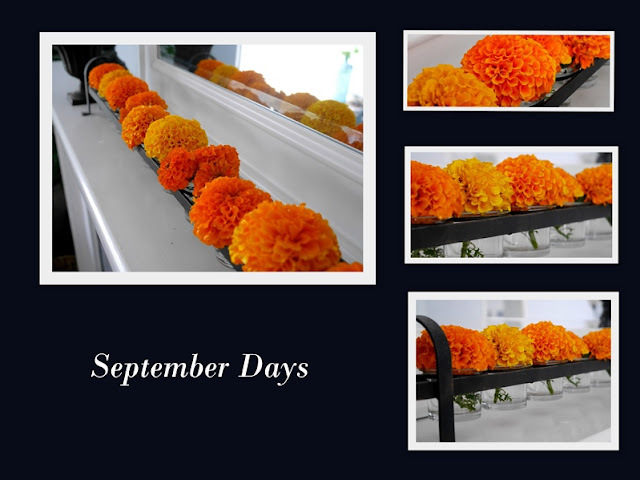 And I like how you have displayed the marigolds ... so pretty. I could happily spend an afternoon just sitting at the harbour watching the boats and planes come and go. Summer may be winding down here too, although this week was really HOT! What a lovely walk, just before, and during the rain, and then so nice to come home and settle in nicely with chores around home, with dinner simmering, and the bright orange beauties to brighten up your mantle! I love the ambiance of your home... no better place to be on a rainy cool day than basking in the coziness of your home. Love it... hugs!